Omololu primarily practices Criminal Law and prosecutes for the Crown Prosecution Service on a regular basis. He also defends on a wide range of cases resulting in acquittals for a significant number of them. Occasionally, he represents on appeals before the immigration appeal tribunals. Omololu is open to instructions on maritime and shipping law having practiced admiralty law extensively in Nigeria for a substantial period. He also obtained a master degree in International Maritime Law from a prestigious university in the UK. 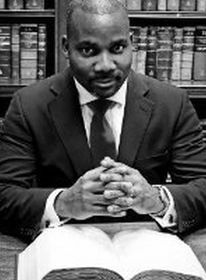 Omololu has a professional approach to his work and a track record of litigation and advice in a wide range of criminal, civil, commercial and maritime cases. As a newly qualified barrister, Omololu defended in a Closure Order Proceedings spanning three days before the magistrates Court. He successfully persuaded the Immigration Appeal tribunal to apply the “exceptional circumstances” rule to a case in an appeal against the decision of the Home Office refusing leave to remain. Omololu is originally a barrister from Nigeria. He had accumulated about five years of practice experience in commercial, civil and admiralty law in Nigeria before coming to the United Kingdom for further studies in 2009. He was part of the team in the landmark case that changed the scope of admiralty jurisdiction in Nigeria. In recognition of his practice in Nigeria, Omololu was shortlisted in the preliminary list of shipping and maritime practitioners in Nigeria by the UK based publications “who’s who legal” in 2010. As a postgraduate student, Omololu volunteered for Citizens Advise Bureau, Swansea and still maintains links to them. After obtaining a masters degree in the UK, Omololu enrolled with the Honourable Society of the Inner Temple as a student member and was called to the English Bar in 2011 after completing the Bar Transfer Test. He undertook his pupillage in one of the leading set of chambers before joining Holborn Chambers in October 2013.